Who makes these decisions? Why is this a thing especially considering Remedy's roots with the Xbox community? Do you think I want to support this game now because of this and to an even worse degree the game being made exclusive to the Epic Games Store on PC? This is the first time a Remedy game will be on a Playstation. Maybe they just testing the waters and want to make a big splash entering the scene with the fan base? I do agree though that exclusives do hurt and only make the industry worse. The publishers get the exclusive deal money while the developers only get sales royalties, but I guess thats just business as bad and poor taste that it is. I never liked 505 games as a publisher with a lot of other games. This only proves more of my point. No it's not, both Max Payne and Max Payne 2 were on PlayStation 2. I have to agree that 505 seems to be doing a really semi-good job on the release of the game. Where I live, the Steelbook Edition doesn't even seem to be available at all, so I'm stuck with the normal Retail xbox Edition, which is lame. And on top of that, the xbox and PC versions are missing a mission from the game. I am very happy that a Remedy game will finally be available on 3 platforms at launch, but 505 doesn't seem like a very sympathetic publisher to me in the way they are handling it. Xbox and PC are also missing a mission? Do you a link for this or something? It was no longer a Remedy game then. IP was Sold to take 2 in 2002 i believe it was. So i didnt count that as it was no longer Remedy’s game. 3 platforms at launch? It is a timed exclusive on Epic for one year. Unless they changed that? You can read that in the pre-order faq. The very existence and need of such thing is ridiculous. The Playstation-Version gets an exclusive mission and some other stuff that is exclusive to that version and will apparently never be available to the other versions. That is so absurd, this mess plus the Epic Store debacle... Customer lost. Ahh ok. I recently purchased an XB1X to play RDR2 and it looks amazing. 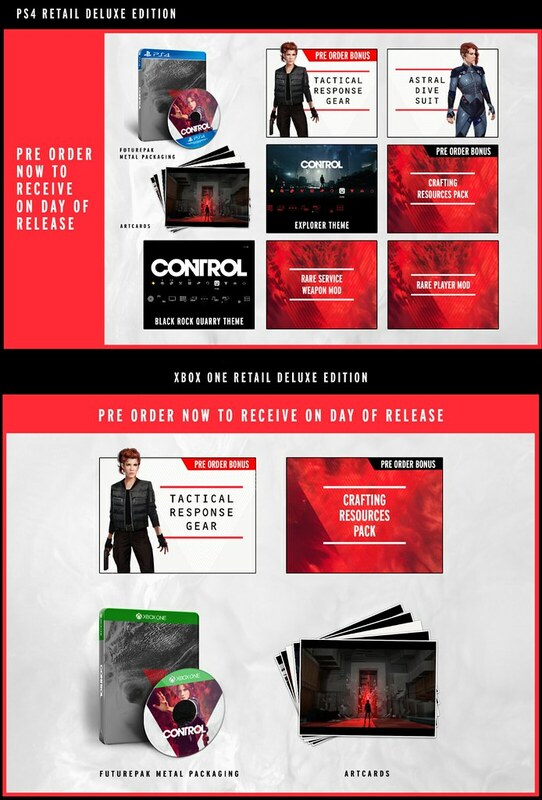 I guess ill just buy control on the xbox instead of PC. Im sure itll look great and Remedy games always play very well on any platform. Yup it does look like the PS4 version does come with "An exclusive extra side mission, “Isolation” " that is not available on PC and Xbox at all. Honestly who make such terrible decisions to ruin sales of a great game ? Honestly developers make such a huge effort to make a great game, and then sales get lost because of mind boggling terrible corporate decisions. It is already out of my Day 1 buy list after it went Epic Store exclusive, and now this is turning really bitter with this game after decisions like the above. Really bitter Remedy, just read the feedback and pass on the feedback to those greedy decision makers, read the sign. RDR2 looks truly amazing on that console. I too own a Xbox One X and will be playing Control on that. But I do remember Quantum Break being not that great on base Xbox One. At least the PC Version that I played a couple of months after when it released on retail was much much better. I hope the One X Version will be great nevertheless. I'm really not sure whether this will hurt sales. But I'm sure 505 made a good deal with Sony/Epic.